If you love Halloween, and you can make toast without burning it — you can build your own props! Give it a try. It's fun and can save you some money. Here are Prop Kits, Prop Parts, DIY Props and Do-It-Yourself supplies! If you have any questions about how to hook something up, or don't know what to buy, email or call us and we will help you for free! When you really want your spooky Halloween props to pop and come to life, you need to use our awesome pneumatic kits to help you animate all your scary props. 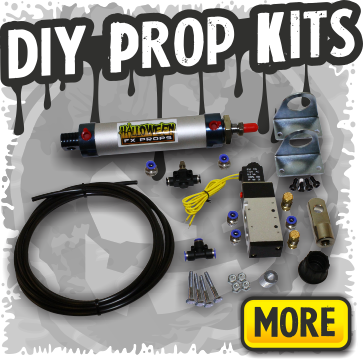 Our pneumatic kits will give you all the parts you need like pneumatic solenoids, fittings, hardware, and air cylinders to really get your Halloween props grabbing and spitting at your terrified victims. Having animated props will propel your haunt into a league of its own, and our pneumatic kits allow you to build all types of startling and creepy props on your own, saving you lots of money. You can also use our pneumatic kits to create your own unique creations that no one else will have. When you shop for animated and pneumatic props, most times you are stuck with what they already have put together, unless of course you buy from us, our team of ingenious Halloween nuts are happy to create custom props for you! Halloween is the best time to really go all out and spook the pants off people. Having animated props and terrifying things that jump out and spit at you is a great way to do that. But if you are going to buy a pneumatic kit to make your props move, you might as well use our pneumatic solenoids to their best ability and also make them into a Halloween spitter and leave your unsuspecting quests covered in fake "toxic waste", blood, or any other gross thing that comes to mind! When you decide to use our awesome Halloween Spitter to spew your guests with goo-like liquids, you are going to have a great time watching them all freak, and you will have everyone screaming and ducking for cover, giving you one of the best laughs you will get all year! So you have a really cool vampire or zombie set up but want it to rise up more to the occasion, in our pneumatic kits section we have the perfect solution, try one of our lid opener kits and have your vamp or half rotten zombie crawling out of the coffin that raises its own lid, just like in the movies. When you use our lid opener kits to have a self-opening lid on your cryptic coffin, it will absolutely make your prop pop to life! Use our pneumatic kits, Halloween spitters, and lid opener kits to really make your animatronic props the stars of your Halloween haunt. Become that evil haunt master that you have been dreaming about all year long by getting a few of our fantastic animatronic props. We have a huge selection to choose from, or you can build some of your own creepy animatronic props with our pneumatic kits that are great for those of you who are into the DIY projects. We have some killer animatronic props though that are air powered, electric, and pneumatic, and are really simple to set up. You will get your fill of screams and fright with our animatronic props and they are of the highest quality so you don't need to worry they will be cheaply made and always breaking every time you turn around because they were poorly crafted of junk parts. We also add those special gory details that really make them realistic and gruesome. Just make sure you keep a bucket and mop handy for when your guests end up peeing their pants in fright! Having a coffin in your arsenal of props is useful if you are going to have vampires, mummies, or zombies in your Halloween haunted house. But coffins are expensive if you go out and buy one, but a DIY coffin is really simple and a lot cheaper to create. So how to build a coffin is what you are asking now right. Well it is pretty simple actually, just gather your supplies like wood, a saw, screws or nails, hammer and screwdriver, measuring tape, some shelf paper, and one of our lid opener kits, and you are well on your way to having a great coffin. First thing you need to know about how to build a coffin is that you will need a template for all the parts. Make it to size and trace it on the shelf paper, then cut your wood, nail or screw the wood pieces together, attach your lid with some hinges, then hook up our lid opener kit and there you have it a great coffin ready for your Halloween haunt that can be reused for years. If you need help and step by step instructions then give us here at Halloween FX a call and we are happy to help or you can go online to www.wikihow.com/make-a-coffin and get instructions there on how to build a coffin.